The plane of the Milky Way is shown as the horizontal across the middle. The north pole of the Galaxy is towards the top. Go to the GLEAMoscope website and use the sliding bar at the top left of the to change the wavelengths shown. (Note the image above is just a still and is not interactive.) Different wavelengths reveal different features, from the dull red glow of hydrogen gas permeating through space, to the stars and dust clouds of our visible galaxy, and superhot gas generating x-rays. Joint observations by the Atacama Pathfinder Experiment (APEX) telescope in Chile and Antarctica’s largest astronomical telescope come closer to making detailed images of the supermassive black hole in the centre of the Milky Way, up to its very edge, the “event horizon”. These successful observations were conducted within the framework of the Event Horizon Telescope – a virtual telescope as big as planet Earth. 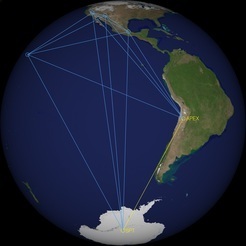 The South Pole Telescope (SPT) and APEX joined together in a ‘Very Long Baseline Interferometry’ experiment for the first time in January 2015. The two telescopes together observed two sources — the black hole at the centre of the Milky Way galaxy, Sagittarius A*, and the black hole at the centre of the nearby galaxy Centaurus A — and combined their signals to synthesize a telescope 7,000 kilometres across. With this success, the SPT joins the Event Horizon Telescope array, which connects APEX, the Large Millimeter Telescope in Mexico, the Submillimeter Telescope in Arizona, the Combined Array for Research in Millimeter-wave Astronomy in California, the Submillimeter Array and James Clerk Maxwell Telescope in Hawaii, and the Institute for Radio Astronomy Millimetrique (IRAM) telescopes in Spain and France. Even though the Milky Way’s black hole is 4 million times more massive than the Sun, it is tiny to the eyes of astronomers. Smaller than Mercury’s orbit around the Sun, yet almost 26,000 light years away, studying its event horizon in detail is equivalent to standing in New York and reading the date on a cent in Germany. With its unprecedented resolution, more than 1,000 times better than the Hubble Telescope, the EHT will see swirling gas on its final plunge over the event horizon, never to regain contact with the rest of the universe. If the theory of general relativity is correct, the black hole itself will be invisible because not even light can escape its immense gravity. However, it might still be seen as a silhouette against the background. Links: MPIfR press release; EHT home. Adapted from a UCLA press release, November 3, 2014. A team led by Andrea Ghez determined that G2 is most likely a pair of binary stars that had been orbiting the black hole in tandem and merged together into an extremely large star, cloaked in gas and dust – its movements choreographed by the black hole’s powerful gravitational field. The research is published today in the journal Astrophysical Journal Letters. Astronomers had figured that if G2 had been a hydrogen cloud, it could have been torn apart by the black hole, and that the resulting celestial fireworks would have dramatically changed the state of the black hole. However, G2 survived and continues on its orbit unaffected. G2 appears to be just one of an emerging class of stars near the black hole that are created because the black hole’s powerful gravity drives binary stars to merge into one. In our galaxy, massive stars primarily come in pairs. The star suffered an abrasion to its outer layer but otherwise will be fine. The team utilized the Keck Observatory’s adaptive optics technology, a powerful technology that corrects the distorting effects of the Earth’s atmosphere in real time to more clearly reveal the space around the supermassive black hole. Links: full UCLA press release, Keck press release. A team of international astronomers has created a detailed three-dimensional map of the dusty structure of the Milky Way, as seen from Earth’s northern hemisphere. Dust and gas, which make up the interstellar medium (ISM), fill the space between stars in galaxies. The dust in the ISM is shaped by turbulent flows that form intricate fractal structures on scales ranging from thousands of light years down to hundreds of kilometers. Rather than measuring the dust itself to create the map, the team has used observations of more than 38 million stars to estimate how much starlight has been obscured by the ISM and thus how much dust lies in our line of sight to each star. This ‘extinction’ map derives from the newly released catalog of the Isaac Newton Telescope Photometric H-alpha Survey of the Northern Galactic Plane (IPHAS), the first digital survey to cover the entire northern Milky Way. The map shows how extinction builds with distance away from the Sun (typically out to 12,000 light years or more) in any part of the surveyed northern Milky Way. The fractal nature of the ISM is visible in the map, as are large-scale features, such as star-forming molecular clouds and bubbles of ionized gas around clusters of hot stars. Links: Full RAS press release; IPHAS homepage for map downloads (large file sizes) c/o Stuart Sale, University of Oxford.